C.J.BOX ask How far would you go to protect some you loved? C.J. Box is a Wyoming native and the author of the award-winning Joe Pickett series of novels. He has won the Anthony Award, Prix Calibre 38 Award (France), the Macavity Award, the Gumshoe Award, the Barry Award, and an Edgar Award and has been an L.A. Times Book Prize finalist. Open Season was selected as a New York Times Notable Book. His nationally bestselling novels have been translated into 12 languages. Box enjoys hunting, fishing, hiking, riding, and skiing throughoutWyoming and the Mountain West. He serves on the Board of Directors for the Cheyenne Frontier Days Rodeo. 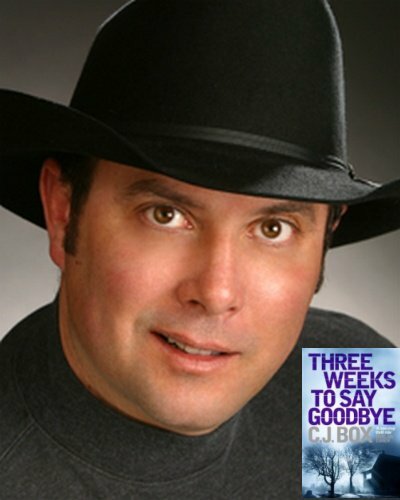 The premise of my new stand-alone novel Three Weeks To Say Goodbye is unlike any of my previous novels. It’s based on an experience that actually happened to some friends of mine. After years of trying to get pregnant, my friends chose to do a very noble thing: adopt a little girl. They chose the open adoption method, meaning they met with the pregnant girl – in this instance an unwed teenager who’d not seen or heard from the birth father for months – and were selected by her to adopt and raise the child. We admired our friends for their decision and we were thrilled how much they loved and cherished their new little daughter. Nine months after they brought her home, their phone rang. It was the adoption agency calling to say the father – a teenage slacker backed by his suspicious father – had never signed away parental custody. The call came just days away from a legal time limit which would have awarded full parental custody to my friends. “This never happens,” the agency people explained to my friends, “We’ve never had this happen before.” The boy intimated that he might just want the little girl – whom he had never even seen – “back at home.” It was a nightmare scenario, made worse by the fact that the teenage father had the law on his side. Over the next months and years, my friends found themselves being held hostage to the impulses and whims of a troubled teenager who knew he had the power to control their lives by withholding his signature from the papers awarding them full parental rights. And the boy ratcheted up his intimidation. He’d drop by their house with his friends. He’d park his car in their driveway at night and sit there. He’d call at all hours. My friends knew at any time they could call the authorities and have the boy arrested. He knew it, too. But if the police became involved, it was clear to my friends the boy would continue to withhold his signature and the nightmare would continue. When I heard the story my blood ran cold. It just wasn’t right, but it was happening nevertheless. How could the legal system be so depraved? And when the rules are stacked against a young couple in the way they were, what could be done to secure the child from almost certain danger? One answer was to strike back at the boy, his friends, and his father -- outside the law. Luckily, my friends were much wiser than Jack and Melissa McGuane in my new novel Three Weeks To Say Goodbye. But I couldn't help thinking of the decisions they could have made. And where those decisions might lead them if they had. This story gripped me in a way that was both exhilarating and a little frightening. It grabbed me by the throat and heart and would not let go until I had written the final page. It's a first person rocket ride to the gates of hell. And it took me to some dark places I'd rather not go again. Again the question: How far would you go? Three Weeks to say Goodbye. (2008). New York: St. Martin's. Blue Heaven (2008). New York: St. Martin's Minotaur. Blood Trail: Joe Pickett Novels (2008). New York: G.P. Putnam's Sons. Free Fire (2007). New York: G.P. Putnam's Sons. In Plain Sight: A Joe Pickett Novel (2006). New York: G.P. Putnam's Sons. Out of Range: A Joe Pickett Novel (2005). New York: G.P. Putnam's Sons. Trophy Hunt: A Joe Pickett Novel (2004). New York: Putnam Publishing Group. Winterkill (2003). New York: Putnam Publishing Group. Savage Run (2003). New York: Putnam Publishing Group. Open Season (2001). New York: Putnam Publishing Group.